I came across this recipe when I was on vacation in Hawaii two years ago. We were staying in a little condo on Molokai, a very beautiful and very tiny island. The owners of the condo had left a pile of books and magazines for their renters to enjoy. Among them was an issue of Met Home that included an article with lots of tasty-sounding Middle Eastern-style recipes. I had never cooked lamb (ground or otherwise) before I tried these kabobs and was pleasantly surprised by how easy it was to manipulate and how yummy the end result was. These kabobs are simple and easy to prepare and only take a few minutes to cook on the grill. 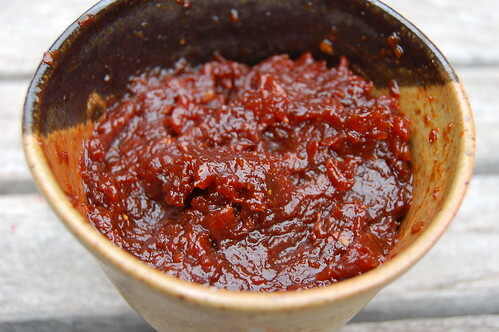 I had also never heard of tomato jam before finding this recipe. Oddly enough, just two days after Nadia and I cooked our Mediterranean feast, Mark Bittman did a piece about tomato jam in the NYTimes. What a coinkydink! I actually liked Bittman's recipe better than the one from Met Home so I've substituted it here. 3. Divide the mixture into 12 equal portions. Shape each portion into a short, thick sausage and push onto the bamboo skewer. 4. 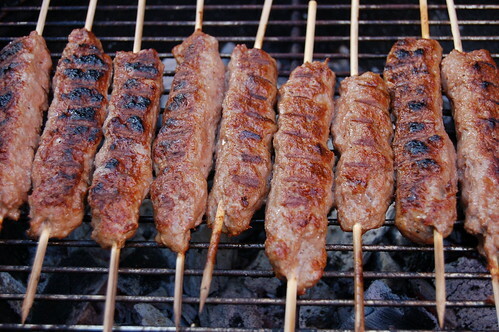 Prepare the grill and grill the kebabs on all sides until done to your taste. * 1/2 a jalapeño pepper, stemmed, seeded and minced, or a pinch of red pepper flakes or cayenne to taste. 1. Combine all the ingredients in a heavy medium saucepan and bring to a boil over medium heat, stirring often. 2. Reduce the heat and simmer, stirring occasionally, until the mixture has the consistency of thick jam, about 1 hour 15 minutes. 3. Taste and adjust seasoning, then cool and refrigerate until ready to use; this will keep at least a week. oh that tomato jam sounds amazing!! !